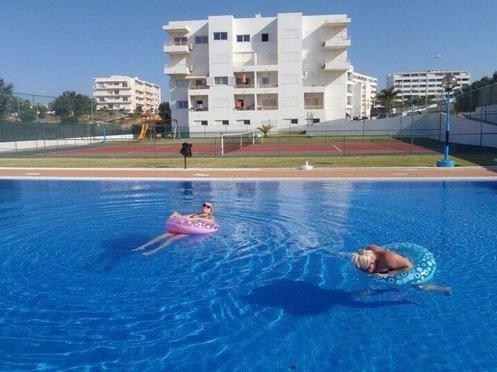 Apartments in Albufeira, Montechoro - Property for sale. Full Description: A great opportunity to acquire a large, 3rd (top) floor, apartment in a private closed condominium in the Montechoro area of Albufeira. Set back from the �strip� yet within walking distance of all amenities including bars, shops, restaurants, cafes, supermarket and newsagents, and only 20 minutes walk to the beach, the location is perfect for holidays or permanent living. Very spacious accommodation comprises an entrance hallway, lounge/dining room, fully fitted and equipped kitchen with a range of Zanussi appliances and small terrace, family bathroom, double bedroom with plenty of wardrobe storage. Off the lounge is a second bedroom and doors to a private terrace with distant sea view. The apartment benefits from air conditioning in all rooms, central vacuum system, security video entry, double-glazing, aluminium shutters and smoke detectors linked to a central system. There is an allocated parking space in the underground remote entry garage as well as plenty of outside parking for visitors. Outside you�ll find the huge communal swimming pool, separate childrens' pool, poolside showers and toilets, childrens' play area, communal garden and sunbathing terraces and a tennis court. As if that�s not enough there is an absolutely massive communal roof terrace with fantastic views of the surrounding area and the sea! Given the location this apartment offers undoubted rental potential and viewing is highly recommended.